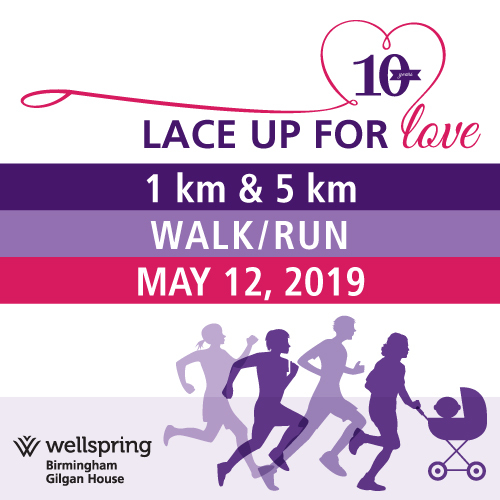 Celebrate Mother’s day this year at the 10th annual, Lace Up for Love, a 1 km and 5 km walk/run in support of Birmingham Gilgan House. Gather your family and friends and join us for a fun morning walk or run on May 12, 2019 at Spencer Smith Park (1400 Lakeshore Road), in Burlington. Registration Fee: $25 for Adults, Free for Youth 12 years and under. If you fundraise a minimum of $150 before May 12, 2019, you will receive a full refund/credit for your registration fee. BONUS: Register before March 31, 2019 and receive a 20% discount on registration ($20 for Adults, FREE for Youth). Please visit www.wellspring.ca/laceup to register today!